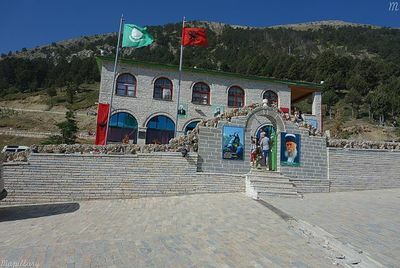 Bektashi shrine of Abaz Aliu, Mount Tomorr, Albania. Monday, May 1st, 2017, marks the Birth Anniversary of al-Abbas ibn Ali (p), 4th of Sha'ban, 1438 A.H.
Al-Majlisi has narrated that "Al-Abbas was a handsome man. When he would mount the horse his feet would reach the ground. He was called the full moon of banu Hashim and He would keep the banner of al-Hussain, peace be upon him." "I am not afraid of death because death keeps calling for retaliation, I fight until I cannot be seen in the heat of the battlefield, my soul is to protect the soul of al-Mustafa, the purified one, I have come with the waterskin [to fetch the water] and I am not afraid of [the coming] battle."